Contact SMS for a free, no-obligation initial consultation. Located in Ithaca, NY and founded in 2000, Smith Marketing Services is a marketing communications consultancy serving a wide range of national, regional, and local B2B and consumer clients. Our firm excels at building multi-faceted, advertising, publicity and direct selling programs that foster an environment for increased sales, market share growth, and lasting customer relationships. Services include: All forms of advertising, web design, branding, graphic design, research, video production, trade show support, product launches, sales & distribution channel support, public relations, and overarching strategy development. 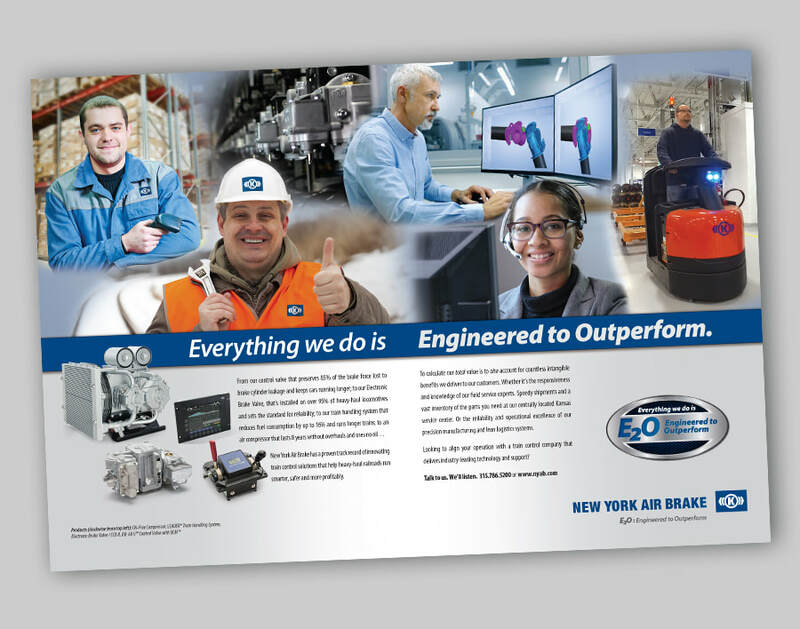 SMS just helped dramatize the 'total customer value' that NYAB delivers to its customers in the rail sector -- with this new marketing initiative centered on the theme "Everything we do is Engineered to Outperform." Learn more about this and other fine work we do in the RR space. Had a great time attending #RSICMA2018 in Nashville this week -- both as a long-time RSI member and in support of our terrific client NYAB. Looking forward to #RailwayInterchange2019 next year! Smith Marketing Services' VP/Creative Director leverages his commute to talk about marketing. John's topic in the installment above: A billboard for Dunkin' Donuts coffee drinks inspired by Girl Scout Cookies. SMS was enlisted to create a massive online, interactive learning course for the Automotive Lift Institute (ALI), which helps technicians in auto repair garages, dealerships, and other contexts safely lift vehicles to reduce the risk of injury, property damage, and damage to one's reputation as a professional. To learn more, watch the YouTube video above or use the button below. New SMS-produced video for REMSA - SMS is pleased to have been asked to develop this video for the Railway Engineering-Maintenance Suppliers Association (REMSA). RAPID ROLLOUT - brings our team to your facility for two concentrated days to get your product launch off the ground fast. 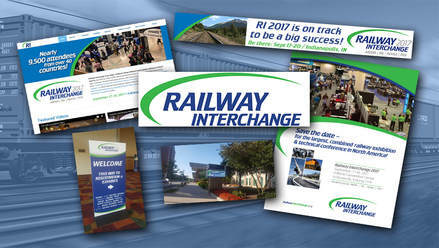 Trade Show Marketing webinar - This webinar was offered to exhibitors at Railway Interchange 2017 (Indianapolis, IN- Sept 17-20) and presented by Doug Smith and John Hoeschele of SMS with webinar host Amanda Patrick, Vice President of Trade Shows and Member Relations at Railway Supply Institute based in Washington, DC. Smith Marketing Services is proud to have played a big role in the marketing and buzz-building of Railway Interchange 2017. Not only did we re-brand this show -- which is held every two years, is North America's largest rail supplier show, and is the joint undertaking of all four leading rail-supply associations (RSI, RSSI, REMSA, and AREMA) -- we developed and maintained the show website, produced the official show highlights video, produced several promotional "Booth Blast" videos for exhibitors, and designed/managed client booths at the event. Learn more! FREE WHITE PAPER: SOCIAL MEDIA GROUND RULES & GUIDELINES The original social media content you generate and re-post should be guided by some basic ground-rules as to what constitutes ‘suitable’ material for posts… Not only to help ensure you are focusing on genuine marketing or business objectives, but also to help protect your organization from PR mishaps that can occur in this new territory. To get you started, we’ve developed these basic — and, by design, generic — guidelines for companies new to the social media landscape. Check it out! New TV spot for Corning Museum of Glass - SMS was enlisted by the Corning Museum of Glass to promote its spectacular Tiffany's Glass Mosaics exhibit for 2017! In concert with a second, more purely 'promotional' TV spot -- this 30 second commercial focused on the historical aspects of the Tiffany story -- and was developed to run in Broadcast and digital media in New York State and northern Pennsylvania. Check it out! thought-starters on precisely that topic! SMS spearheaded the press conference for the new Smith Allergy and Asthma Specialists office in Cortland (June, 2017). 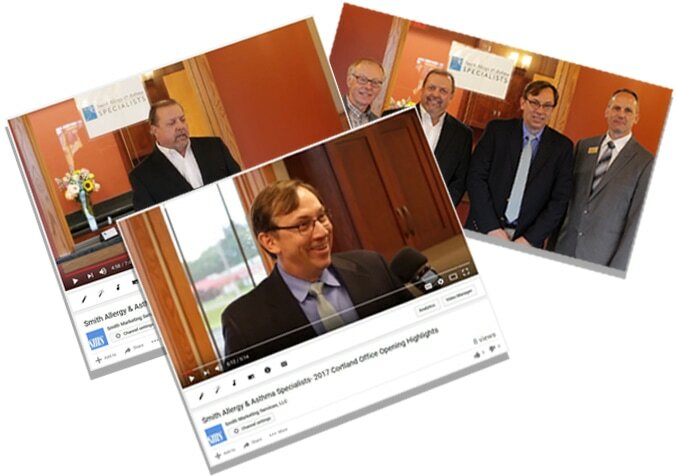 The project included media relations, press releases/advisories, coordination and documentation of a ribbon cutting ceremony (featuring comments from Dr. Chris Smith, founder of the practice), and promotion of the event on social media. Check out the highlights video here.